Background: The purpose of this study was to investigate the phenolic composition and antioxidant activity of Thymbra sintenisii subsp. isaurica extract (TSIE) and, to evaluate, for the first time, anticancer effect on human MCF-7 (breast carcinoma) cells. Materials and Methods: The antioxidant capacity of TSIE was evaluated using 2,2-diphenyl-1-picrylhydrazyl (DPPH) and total polyphenol assays. The anticancer activities of TSIE were tested on MCF-7 (breast carcinoma) cells. Results: Total polyphenol value of extracts TSIE was found as 73.02 mg gallic acid /g powder. DPPH result of IC50 value of TSIE was found to be 27.15 μg/mL. To examine anticancer effect of TSIE at different concentrations were given on MCF-7 cells. TSIE was observed to reduce the cell viability in a dose-dependent manner. This anticancer property of the TSIE provides a highlights the importance of plant research for drug design. Conclusion: In this study, anticancer effects and antioxidant level of endemic species, that is TSIE, are evaluated on MCF-7 cells. Thus, an effective therapeutic agent for cancer treatment is aimed to develop. Further studies are needed to better understand the molecular mechanisms underlying this effect of TSIE. Cancer is a pathological condition that occurs as a result of uncontrolled cell proliferation and losing the ability of apoptosis. Cancer is the second major cause of disease-induced deaths in many countries of the world. The reasons of having so high incidence of cancer are the factors such as average age, eating habits, and duration of exposure to environmental carcinogens. The International Agency for Research on Cancer predicted that the number of cancer cases, which has been 12.7 million in 2008, will reach 21.4 million by 2030.,,,, At present, surgeries, chemotherapy, radiotherapy, and hormone replacement therapy are the methods used in the treatment of cancer. Chemotherapy is the method that is widely used in the treatment of cancer; however, the disadvantages such as inactivity, serious toxicity, and multidrug resistance decrease its success rate. Therefore, new strategies are needed to overcome resistance to anticancer drugs. In recent years, natural products often come fore for the treatment of cancer cells. Natural products played a very important role in the development of traditional medicine and in the treatment of diseases. In Turkey, there are many aromatic plant species from Lamiaceae family, which are defined as “thyme” and used for this purpose. However, the species containing especially thymol/carvacrol type of essential oil are regarded as “thyme”.,Lamiaceae family is quite powerful in terms of biological activity, and there are many studies reporting anticancer activities of the extracts and essential oils obtained from these species, in addition to their antimicrobial, antiviral, antiparasitic effects.,,Thymbra is a small type of Lamiaceae (Labiatae) family, containing six taxa from four types. The type lies in the Mediterranean basin from Portugal's west sides to the west of Iran. Five of these taxa, namely Thymbra spicata L. subsp. spicata, T. spicata L. subsp. intricata T. sintenisi L. subsp. sintenisi, T. sintenisi L. subsp. isaurica ve T. capitata L. Cav. grows naturally in our country. T. sintenisii subsp. isaurica is an endemic subspecies that grows in our country, in the Alanya region of Antalya. Bıavatı et al. observed that essential oil of this species has antimicrobial activity. Again, Poças et al. have conducted a study about the anticancer effect of TC, which is one of these species, on MCF-7 (breast cancer) and ROK (peripheral blood) cell lines, and they observed the antitumor activity of TC. However, Thymbra sintenisii subsp. isaurica [Figure 1], which is an endemic species, has not been studied enough. The purpose of this study was to investigate the phenolic composition and antioxidant activity of TSIE and, to evaluate, for the first time, anticancer effect on human MCF-7 cells. Dimethyl sulfoxide, sodium carbonate, Folin reagent, gallic acid, ethanol, DPPH (2, 2-diphenyl-1-picrylhydrazine), and ascorbic acid were purchased from Sigma (St. Louis, MO, USA). Cell Proliferation Kit II (XTT) and Dulbecco's Modified Eagle's Medium (DMEM)-high glucose were purchased from Sigma (St. Louis, MO, USA). Penicillin, streptomycin, and trypsin were purchased from Gibco (Paisley, Scotland, England), Eagle's minimum essential medium and fetal bovine serum (FBS) from Biochrom (Berlin, Germany), and phosphate buffer saline (PBS) tablet from Medicago (Uppsala, Sweden). T. sintenisii subsp. isaurica was collected from its natural habitat in Alanya district of Antalya province, Turkey [Table 1]. The leaves of T. sintenisii subsp. isaurica were washed in distilled water. They were dried in the laboratory for 2 weeks. Twenty grams of this sample was taken and was placed with 40 ml of ethanol solvent for extraction. Solution thus was formed for 24 h in a Soxhlet apparatus. The resulting extract was evaporated using rotary evaporation (rotary evaporator) at 45°C. Identification was based on the molecular structure and calculated fragments. Interpretation of mass spectrum gas chromatography-mass spectrometry (GC-MS) (7890A GC System, 5975C with Triple-Axis Detector) was conducted using the database of National Institute Standard and Technology having >62,000 patterns. The name and structure of the components of the test materials were ascertained. The spectrum of the unknown component was compared with the spectrum of the component stored in the Wiley Library. This is done to determine whether this plant species contains any individual compound or group of compounds, which may substantiate its current commercial and traditional use as an herbal medicine. Total polyphenol content of T. sintenisii subsp. isaurica was determined spectrophotometrically, using modified Folin–Ciocalteu method. The method is based on the reduction of phosphotungstic acid (H3P[W3O10]4) into phosphotungstic blue in a basic solution. The absorbance of the produced phosphotungstic blue is proportional to the number of phenolic groups. To determine total polyphenol content, gallic acid was used as a standard. DPPH (2, 2-diphenyl-1-picrylhydrazine) radical scavenging activity of T. sintenisii subsp. isaurica extract was determined by modifying the method developed by Ou et al. When interacted with antioxidant substance or substances, the strength of the purple color arising from DPPH decreases and leads to a decrease in absorbance values. Various concentrations of the extract were prepared and equal volume (1000 μL) of DPPH and sample solutions was mixed and incubated at room temperature for 30 min. At the end of this period, they were measured at 517 nm wavelength, where DPPH gives maximum absorbance value. To compare the results, ascorbic acid was used as a natural antioxidant. The results are given in μg/mL, after calculating IC50 value. Two cell lines were used in this study: MCF-7, and L929 cells were purchased from America Type Culture Collection (ATCC). The medium environment that we used in our study was DMEM, containing 10% fetal bovine serum (FBS), 1% L-glutamine, 1% penicillin-streptomycin. MCF-7 and L929 cells were cultured in DMEM with a 5% CO2 at 37°C in an incubator. Cytotoxicity effects of T. sintenisii subsp. isaurica extract on MCF-7 and L929 cell lines were determined by XTT (2, 3-bis (2-methoxy-4-nitro-5-sulfophenyl)-5-[(phenylamino) carbonyl]-2H-tetrazolium hydroxide) assay 24 and 48 h after treatment. XTT solution was prepared mixing XTT agent (labeling reagent)/activation agent (electron coupling reagent) at 50/1 ratio. The intensity of the orange color resulting from formazan is proportional to the number of live cells. The cell viability was determined according to the intensity of the orange color observed at the end of the incubation period, which was measured in a microplate reader in the reference range of 475 nm. All absorbance was compared to control samples (cells without any test compound) which represented 100% viability. Cell viability was determined using in Equation 1. Where As: sample and AC: control. To investigate the role of T. sintenisii subsp. isaurica extract, which showed selective toxicity in MCF-7 cell line, flow cytometric measurement was performed using annexin-V (apoptosis) and propidium iodide (PI) commercial kits. For MCF-7 cells, appropriate doses of T. sintenisii subsp. isaurica extract and cisplatin ingredients were left in incubation for 24 and 48 h. At the end of this period, the content of the plate was suspended. The cells were washed with PBS, treated with trypsin-ethylenediaminetetraacetic acid, and centrifuged at 800 rpm for 8 min. After counting the obtained cells with trypan blue, 5 μL annexin V and 5 μL PI were added. They were incubated in the dark, at room temperature for 15 min. Following the incubation, 400 μL of binding buffer was added to each tube and data from 104 cells were collected and measured on flow cytometry within 1 h (emission; 530 nm, excitation; 488 nm). Data were carried out in triplicate and results were expressed as mean ± standard deviation (mean ± S.D). One-way ANOVA and post hoc Tukey analyses were used to reveal the relationships between groups. The differences were accepted as significant for P < 0.05. The GC-MS analysis of TSIE revealed the presence of 19 compounds (phytochemical constituents) that could contribute the medicinal quality of the plant. The identification of the phytochemical compounds was confirmed based on the peak area, and retention time. The active principles with their Retention time (RT), and peak area (%) in percentage are presented [Table 2] and [Figure 2]. 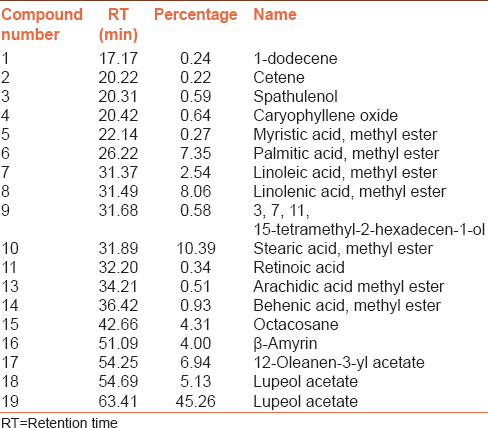 Biologically active compounds identified through GC-MS analysis are showed [Table 2]. Total polyphenol value of extracts TSIE was found as 73.02 mg gallic acid /g powder. DPPH result of T. sintenisii subsp. isaurica extract was calculated according to IC50 value. IC50 value of T. sintenisii subsp. isaurica extract was found to be 27.15 μg/mL, whereas IC50 value of ascorbic acid, whose DPPH radical scavenging effect is very high, was found to be 5.02 μg/mL. MCF-7 and L929 were treated with various concentrations of T. sintenisii subsp. isaurica extract and cisplatin for 24 and 48 h. Their effects on cell growth were determined by XTT assay. IC50 values for tested compounds are presented in [Table 3]. The annexin V flow cytometry analysis recognized among early apoptosis, late apoptosis, apoptotic, or necrotic phase in which the cells tagged with both annexin V and PI. The results of the annexin V analysis of MCF-7 cells are presented in [Figure 3] for 24 and 48 h, respectively. The results are given in [Table 4]. In recent years, plants for their antiproliferative effects have become the major strategy in the search for new anticancer agents. Scientists have always been interested to active compounds of natural sources. Natural products are an extremely important resource for medical agents. However, although a new approaches to drug discovery emerges day by day, none of them is as important as the place of natural products in drug development. The composition of TSIE was determined by GC-MS analyses. We have identified 19 compounds, of which lupeol aceta (45.26%), stearic acid (10.39%), and linoleic acid (8.06%) are the main components. Barberan et al. 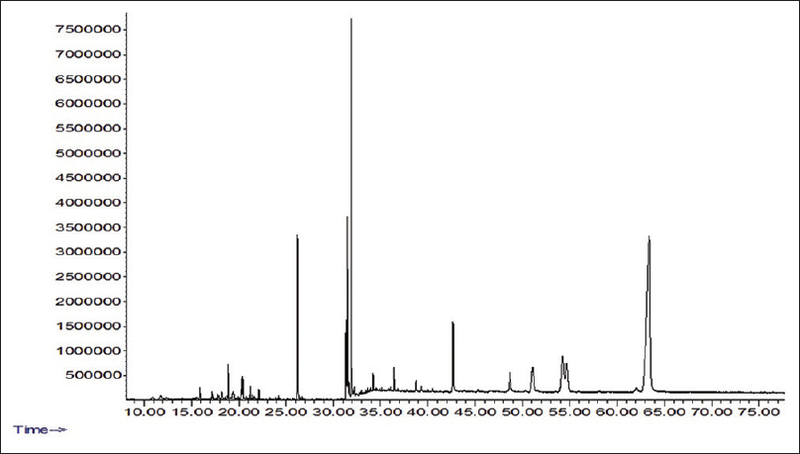 performed GC-MS analysis of Thymbra capitata species and they observed that the flavanoid content of this type is high. Baser et al. showed GC-MS analysis of Thymbra sintenisii Bornm et Aznav subsp. Sintenisii and the major bioactive component of plant extract has been found carvacrol and thymol. Our GC-MS results were different from previous reports, type of solvents and extraction method. This situation may arisen from harvested region and climate. Various in vitro assays can be used to determine the antioxidant activity of plant extracts. We use the total polyphenol test and DPPH scavenging assay for determining the antioxidant capacity in our study. Total polyphenol value of extracts TSIE was found as 73.02 mg gallic acid /g powder. It was observed that TSIE were quite effective, and IC50 27.15 mg/mL for DPPH. Galego et al. investigated antioxidant activity of essential oils of TC, Origanum vulgare (OV), Thymus mastichina, and Calamintha baetica species (100, 250, 500, 750, and 1000 mg/L). The highest values of DPPH inhibition of TC and OV were observed in species. Faleiro et al. have evaluated on the antioxidant and antimicrobial features of TC (L.) Cav. species and they found that antioxidant and antimicrobial characteristics of this type are high. Saidi et al. observed that DPPH scavenging activity of T. spicata L. was stronger than butylated hydroxytoluene. Our outcome were generally similar to the those of other studies in literature. The XTT assay is to evaluate the anticancer activity of the products, which is a precise, simple, and reliable method. Cytotoxicity studies for many essential oils have been reported.,, Cell culture of MCF-7 was found IC50 values were 7.55 μg/mL, 10.48 μg/mL for 24 and 48 h, respectively. 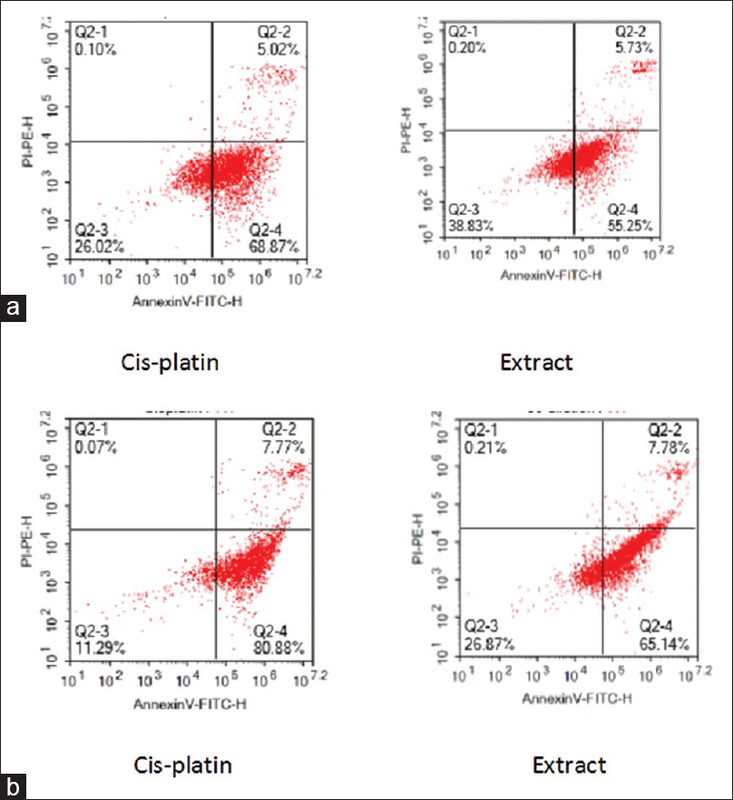 Cell culture of L929 was found IC50 values were 12.63 μg/mL, 9.26 μg/mL for 24 and 48 h, respectively. Other studies of Thymbra species investigated the antiproliferative effects and Miguel et al. have obtained essential oils of TC and Thymus species. They examined antioxidant and antiproliferative effects of these essential oils. Caespititius from Pico and T. capitata carvacrol rich in Portugal produce essential oils 50 μg/mL has decreased cell viability to 50% at the end of the incubation 96 h. It is considered effective in preventing cell proliferation highly of thymol and carvacrol content. Satureja sahendica is a type of Lamiaceae (labiatae) and has high thymol content. Yousefzadi et al. stated that it has reduce cell viability in human colon adenocarcinoma (SW480), MCF7, horiocarcino to (JET3), and monkey kidney (Vero) cells. Loizzo et al. found IC50 values of this species against MCF-7 cell line as (IC50 >50 μg/ml), they also worked on another species of this family, and they observed that it had no effect on MCF-7 cell line. In our study, cell viability of MCF-7 cells also decreased in a dose-dependent manner. In the recent years, many studies for developing anticancer therapy has focused on apoptosis or programmed cell death. Apoptosis or programmed cell death; preserved throughout evolution, quite complex, occurs naturally in all tissues to maintain become homeostasis and eliminate damaged or unwanted cells., The studies in the literature has examined; Carvacrol, the predominant monoterpene in many essential oils of, Thymbra, Thymus. Koparal and Zeytinoglu were showed that carvacrol treated A549 cells, carvacrol caused decrease in cell number. There has been no report of TSIE with apoptosis studies in the literature. In order to our results the comparison of extract sample with cisplatin drugs showed that the extract killed cancer cells [Figure 3]. Although it has not performed as good as the cisplatin, this extract is considered as a good result. It was observed that necrosis did not change both of them [Table 4]. As a result, this study showed that antioxidant activity of T. sintenisii subsp. isaurica extract is high. The extent of the antioxidant activity is based on its polyphenol content. It was observed that T. sintenisii subsp. isaurica extract has anticancer effect. There is a need for further studies in this area. This study was supported by CUBAP Project No. ECZ-11. Basanagouda M, Jambagi VB, Barigidad NN, Laxmeshwar SS, Devaru V, Narayanachar, et al. Synthesis, structure-activity relationship of iodinated-4-aryloxymethyl-coumarins as potential anti-cancer and anti-mycobacterial agents. Eur J Med Chem 2014;74:225-33. Williams GM. DNA reactive and epigenetic carcinogens. In: Barrett JC, editor. Mechanisms of Environmental Carcinogenesis. Vol. 1. Role of Genetic and Epigenetic Changes. Boca Raton, FL: CRC Press, Inc.; 1987. p. 113-27. Williams GM. Definition of a human cancer hazard. In: Nongenotoxic Mechanisms in Carcinogenesis. Banbury Report 25. New York: Cold Spring Harbor Laboratory; 1987. p. 367-80. Williams GM. DNA reactive and epigenetic carcinogens. Exp Toxicol Pathol 1992;44:457-64. Williams GM. Mechanisms of chemical carcinogenesis and application to human cancer risk assessment. Toxicology 2001;166:3-10. Monteiro Lde S, Bastos KX, Barbosa-Filho JM, de Athayde-Filho PF, Diniz Mde F, Sobral MV, et al. Medicinal plants and other living organisms with antitumor potential against lung cancer. Evid Based Complement Alternat Med 2014;2014:604152. Başer KH, Özek T, Kürkçüoǧlu M, Tümen G. The essential oil of Origanum vulgare subsp. hirtum of Turkish origin. J Essent Oil Res 1994;6:31-6. Erken S. Morphological and anatomical studies on Thymbra sintenisii Bornm. & Aznav. (Labiatae). Turk J Bot 2005;29:389-97. Palmeira-de-Oliveira A, Gaspar C, Palmeira-de-Oliveira R, Silva-Dias A, Salgueiro L, Cavaleiro C, et al. The anti-Candida activity of Thymbra capitata essential oil: Effect upon pre-formed biofilm. J Ethnopharmacol 2012;140:379-83. 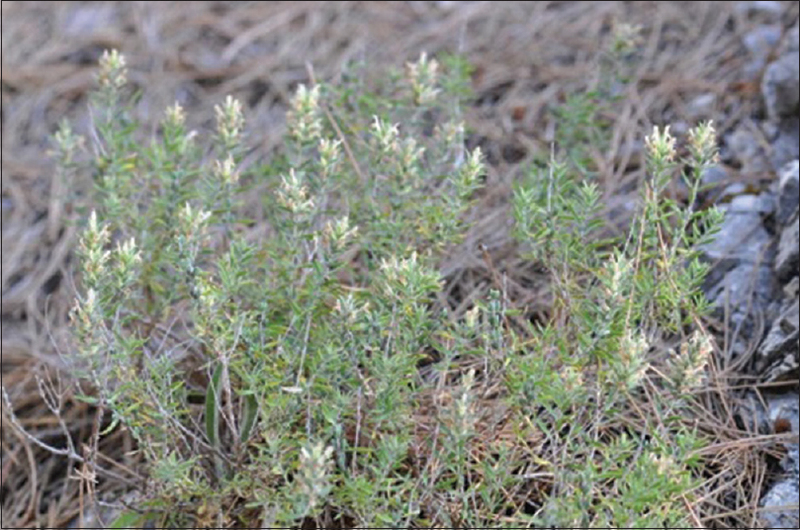 Bıavatı B, Özcan M, Pıccaglıa R. Composition and antimicrobial properties of Satureja cuneifolia Ten. and Thymbra sintenisii Bornm. et Aznav. subsp. isaurica P.H. Davis essential oils. Ann Microbiol 2004;54:393-401. Poças J, Lemos MF, Cabral C, Salgueiro L, Pires IM. Anticancer properties of Thymbra capitata and Helichrysum italicum essential oils. Front. Mar. Sci. Conference Abstract: IMMR | International Meeting on Marine Research 2014. doi: 10.3389/conf.fmars.2014.02.00010. Murugann R, Parimelazhagan T. Comparative evaluation of different extraction methods for antioxidant and anti-inflammatory properties from Osbeckia parvifolia Arn. An in vitro approach. J King Saud Univ Sci 2014;26:267-75. Lambertini E, Lampronti I, Penolazzi L, Khan MT, Ather A, Giorgi G, et al. Expression of estrogen receptor α gene in breast cancer cells treated with transcription factor decoy is modulated by bangladeshi natural plant extracts. Oncol Res 2005;15:69-79. Fridovich I. Superoxide radical: An endogenous toxicant. Annu Rev Pharmacol Toxicol 1983;23:239-57. Ou B, Huang D, Hampsch-Woodill M, Flanagan JA, Deemer EK. Analysis of antioxidant activities of common vegetables employing oxygen radical absorbance capacity (ORAC) and ferric reducing antioxidant power (FRAP) assays: A comparative study. J Agric Food Chem 2002;11:3122-8. Kose M, Hepokur C, Karakas D, McKee V, Kurtoglu M. Structural, computational and cytotoxic studies of square planar copper (II) complexes derived from dicyandiamide. Polyhedron 2016;117:652-60. Koopman G, Reutelingsperger CP, Kuijten GA, Keehnen RM, Pals ST, Van Oers MH. Annexin V for flow cytometric detection of phosphatidylserine expression on B cells undergoing apoptosis. Blood 1994;84:1415-20. Ali R, Mirza Z, Ashraf GM, Kamal MA, Ansari SA, Damanhouri GA, et al. New anticancer agents: Recent developments in tumor therapy. Anticancer Res 2012;32:2999-05. Heinrich M, Bremner P. Ethanobotany and ethanopharmacy-their role for anticancer drug development. Curr Drug Targets 2006;7:239-45. Faleiro L, Miguel G, Gomes S, Costa L, Venâncio F, Teixeira A, et al. Antibacterial and antioxidant activities of essential oils isolated from Thymbra capitata L. (Cav.) and Origanum vulgare L. J Agric Food Chem 2005;53:8162-8. Saidi M, Ghafourian S, Zarin-Abaadi M, Movahedi K, Sadeghifard N. In vitro antimicrobial and antioxidant activity of black thyme (Thymbra spicata L.) essential oils. Roum Arch Microbiol Immunol. 2012;71:61-9. Barberan F, Hernandez L, Tomas F. A Chemotaxonomic study of flavonoids in Thymbra-Capitata phytochemistry. Phytochemistry 1986;25:561-62. Baser KH, Özek T, Ermin N, Tümen G, Duman H. Essential Oil of Thymbra sintenisii Bornm. et Aznav. subsp. Sintenisii. JEOR 1997;9:355-6. Jin D, Russell JM. Plant phenolics: extraction, analysis and their antioxidant and anticancer properties. Molecules 2010;15:7313-52. Galego L, Almeida V, Gonçalves V, Costa M, Monteiro I, Matos F, et al. Antioxidant activity of the essential oils of Thymbra capitata, Origanum vulgare, Thymus mastichina and Calamintha baetica. Proceedings of the International Symposium Plants as Food and Medicine: The Utilization and Development of Horticultural Plants for Human Health, Acta Horticulturae 2008;765:325-34. De Sousa AC, Alviano DS, Blank AF, Alves B, Alviano CS, Gattass CR. Melissa officinalis L. essential oil: Antitumoral andantioxidant activities. J Pharm Pharmacol 2004;56:677-81. Prashar A, Locke IC, Evans CS. Cytotoxicity of lavender oil and its major components to human skin cells. Cell Prolif 2004;37:221-29. Lampronti I, Saab AM, Gambari R. Antiproliferative activity of essential oils derived from plants belonging to the magnoliophyta division. Int J Oncol 2006;29:989-95. Miguel MG, Gago C, Antunes MD, Megías C, Cortés-Giraldo I, Vioque J, et al. Antioxidant and antiproliferative activities of the essential oils from Thymbra capitata and Thymus species grown in Portugal. Evid Based Complement Alternat Med 2015;2015:851721. Doi: 10.1155/2015/851721. Yousefzadi M, Riahi-Madvar A, Hadian J, Rezaee F, Rafiee R. In vitro cytotoxic and antimicrobial activity of essentialoil from Satureja sahendica. Toxicol Envıron Chem 2012;4:1735-45. Loızzo M, Tundıs R, Menıchını F, Saab A, Stattı G, Menıchını F. Cytotoxic activity of essential oils from Labiatae and Lauraceae families against in vitro human tumor models. Anticancer Res 2007;27:3293-9. Hanahan D, Weinberg RA. The hallmarks of cancer. Cell 2000;100:57-70. Taraphdar AK, Roy M, Bhattacharya RK. Natural products as inducers of apoptosis: ımplication for cancer therapy and prevention. Curr Sci 2001;80:1387-96. Koparal AT, Zeytinoglu M. Effects of Carvacrol on a Human Non-Small Cell Lung Cancer (NSCLC) Cell Line, A549. Cytotechnology 2003;43:149-54.